On Oct. 20, 2011, Muammar Qaddafi was grotesquely murdered on camera. Secretary of State Hillary Clinton had said, “I want him dead,” and after his death she made her famously imperial boast, “We came, we saw, he died,” refiguring Julius Caesar’s message to the Roman Senate after one of his conquests in the same Mediterranean region. One would have had to be extraordinarily naive to believe that the U.S. and NATO attacked Libya to “stop genocide and mass atrocities,” as Secretary of State Clinton, NSC advisor Samantha Power and U.N. Ambassador Susan Rice claimed at the time. Or to believe Ambassador Rice, who traveled to Libya after the conquest and then traveled on to Rwanda, where she pronounced: “This time, the Security Council acted. And acted in time. Having failed in Rwanda and Darfur, it did not fail again in Libya. Within less than two days, American firepower played a decisive role in stopping Qaddafi’s forces and saving Benghazi.” That should be enough to make anyone wonder what really happened in Rwanda and Darfur. 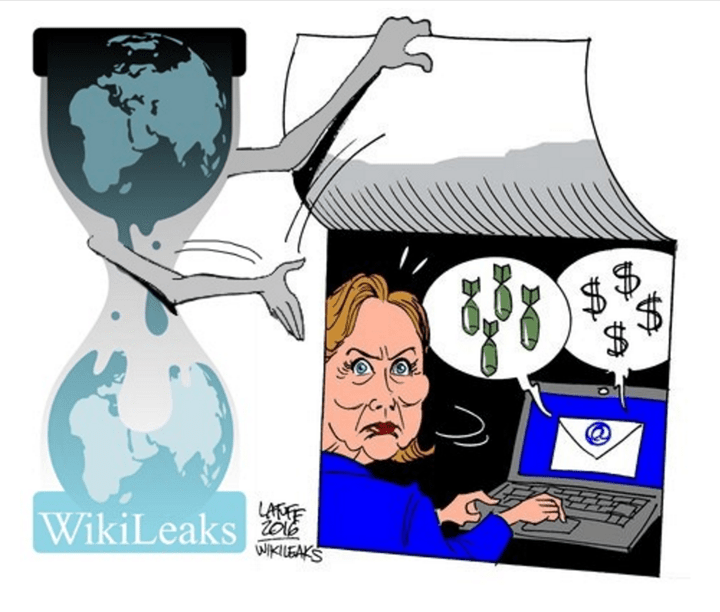 Most anyone paying serious attention knew that there was a lot of blood for oil involved in the NATO war on Libya, but now we have confirmation in the Wikileaks searchable database of Hillary Clinton’s private e-mails, which were made available in response to a Freedom of Information Act request. 4) U.S. educated and exiled Mahmoud Shammam, Al-Ahrar TV’s co-founder, who had by then become Libya’s new minister of communications. On Oct. 25, 2011, Mahmoud Shammam had told Telegraph.co.uk.video that Qaddafi had been buried in a secret location that was not a Moslem cemetery. (SBU) Waha Group returns: In a November 16 meeting with Ambassador, country managers of the three U.S. firms comprising the Waha Group (Marathon, ConocoPhillips and AmeradaHess) said meetings with its Libyan joint venture partner and the National Oil Company [NOC] this week were “extremely positive” and that they were encouraged by an apparent sea change in the NOC’s attitude toward its U.S. partners. The Waha Group, the only majors that have not yet resumed production in Libya, will visit its 7 fields for the first time in the coming weeks and will be producing 50,000-70,000 bpd before ramping up to 100,000 bpd by year’s end. The consortium will have to invest in some replacement parts and logistical equipment before it returns to last year’s production levels of 350,000 bpd. Initial production will come from its Samah and Dahrah, deemed the safest of its oil fields, while larger fields closer to Sine still face security issues. (SBU) Waha continued: The TNC [Transitional National Government] likely will announce the formation of a Ministry of Petroleum in this interim period that will assume the regulatory role previously exercised by the NOC, they said. The favored candidate to lead the Ministry is Abdulrahman Benyeza, a respected and knowledgeable technocrat educated at the University of Texas. The TNC and NOC will be focused on production restoration for the next 18-24 months and it is unlikely they will risk the loss of time and money in reviewing contracts during this period. They welcomed a shift in attitude toward “partnership,” and noted with optimism that the country’s reconstruction will provide an economic driver largely absent from the Qadhafi-era kleptocracy. (SBU)CBLassets: SamiRais, the Central Bank of Libya lead on frozen assets, said he is planning a tour of Washington, London and New York to appeal to the US, UK and UN to delist the CBL and lift remaining restrictions on its assets. Rais said the TNC will need funds to carry out any weapons-buyback programs and resolve the domestic liquidity crunch. (SBU) IAEA: According to UNSMIL [United Nations Support Mission in Libya], IAEA is planning to visit Libya in early December. Based on Libya’s full compliance with its HEU [Highly Enriched Uranium] obligations in December 2009, the IAEA is satisfied that all of the GOL’s former nuclear weapons facilities are under appropriate safeguards but is concerned about the medical and commercial uses of cobalt and uranium. (SBU) Libya Al-Ahrar TV: In a meeting with PAO, Libya Al-Ahrar [TV] Executive Manager Seraj Beshti dismissed rumors about Qatar’s purported “60 days’ notice” and eventual expulsion order for the network to leave Doha. Beshti noted that some financial issues have arisen with the Qatari government; salaries are delayed and at some point the Qataris did ask the network to reduce its staff footprint. However, Beshti affirmed that Doha has never interfered with the channel programming or news editorials. Beshti said that within the network’s offices there is debate about the proper role and longevity of Minister of Communications Mahmoud Shammam’s tenure at the station. Although Shammam founded the network, there is growing discomfort with him retaining a management position– albeit an absentee position– while retaining a government post in Tripoli. Following November 14 protests by the Warshafana tribe regarding comments made by Shammam, the network issued a formal apology but further stoked debate and dissent within the network’s offices regarding Shammam’s role. Ingin mendaki gunung semeru tapi bingung bagaimana memulainya, maka sebaiknya pakai layanan paket pendakian semeru untuk mencapai puncak mahameru. Semua peralatan yang dibutuhkan disediakan secara lengkap dalam paket pendakian semeru ini. Anda tidak perlu repot-repot lagi mempersiapkan hal teknis yang berkaitan dengan pendakian gunung semeru ini. Limpahkam semuanya kepada Natural Sunrise Tour sebagai tour &amp; travel penyedia paket pendakian semeru. Berikut estimasi dan biaya dalam paket pendakian gunung semeru baca blog berikut. Objek wisata teluk hijau banyuwangi atau yang biasa disebut green bay merupakan salah objek wisata pantai di kabupaten banyuwangi yang selalu ramai didatangi oleh wisatawan. Letak pantai teluk hijau banyuwangi lumayan cukup jauh dari pusat kota banyuwangi, anda bisa menggunakan jasa transportasi sewa mobil untuk keliling wisata di kabupaten banyuwangi, termasuk juga mengunjungi wisata pantai teluk hijau banyuwangi (green bay). Mencari rental mobil di malang yang harganya murah dan terpercaya agak gampang-gampang sulit. Anda bisa minta rekomendasi dari kenalan anda yang pernah menggunakan jasa rental mobil malang dan merasa puas dengan pelayanannya. Yang terpenting adalah anda bjsa nyaman dalam perjalanan tersebut saat menggunakan rental mobil di malang tanpa terkendala apapun. Dan juga booking rental mobil malang tersebut tidak ribet. rental mobil di malang . Beberapa perusahaan yang menyediakan jasa rental mobil di malang klik tautan ini. Menikmati perjalanan yang nyaman dengan menggunakan transportasi rental mobil di kota malang sangat dianjurkan, terutama bagi para wisatawan yang sedang berlibur di malang batu. Rental mobil di kota malang bisa 12 jam, full day atau seharian penuh, 24 jam atau paket drop off. Anda juga bisa pesan rental mobil di kota malang sekaligus dengan driver agar perjalanan bisa aman dan nyaman, karena semua sopir pada rental mobil di kota malang sangat berpengalaman dan profesional. Jamu ramuan madura tidak hanya populer di madura saja, banyak masyarakat indonesia yang juga mengetahui dan mengkonsumsi ramuan madura secara rutin. Dan bahkan ramuan madura ini juga tersebar ke beberapa negara luar negeri seperti malaysia, arab saudi, hongkong, taiwan dan singapura. Jamu ramuan herbal madura ini dibawa oleh para perantauan yang mengais rejeki di luar negeri tersebut. ramuan madura herbal . Beberapa manfaat ramuan madura untuk pria dan wanita baca info lengkap. Awesome submit which has got me considering the potential of this concept. investment financing baltimore is agreat place for financing USA . anyone get better offer from out finance investment opportunity.